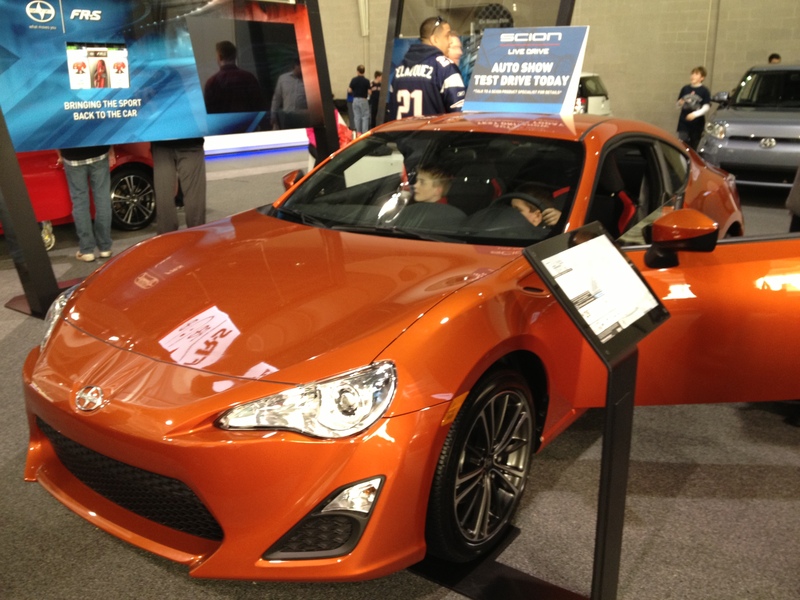 Last week, I had the time (thankfully) to attend the New England International Auto Show at the Seaport Convention Center in Boston. Despite being deep in my studies for the semester, I figured there is always time to wrap my hands around the supple leather steering wheels of some of the most exciting and desirable new cars. And hey, it gave my family an excuse to come visit me and treat me to dinner too. Beats the hell out of reading Motor Trend and eating Ramen (sorry Motor Trend, I still want to work for you some day). To my delight, there were several ultra-exotics present at the show, including exhibits from Aston Martin, Bentley, Rolls Royce, and Lamborghini, but in the spirit of the Common Gearhead, I’ve compiled a list of the top 5 most impressive fiscally-reasonable rides. Unfortunately, I wasn’t able to test drive any of these (something about being too young, or a stupid hoonigan…), so this list is based solely on my knowledge of the performance of these cars, and more importantly, how much actually sitting in them impressed me. That’s right folks. 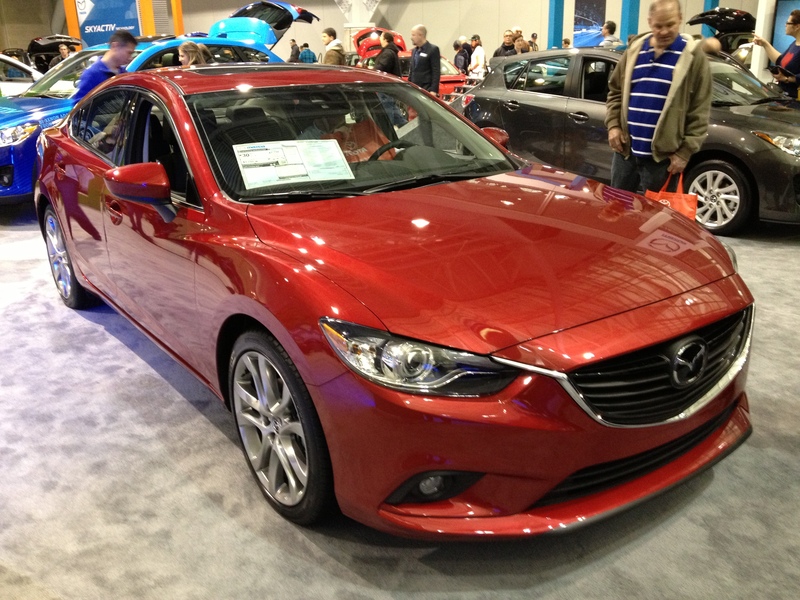 The number 5 most exciting car on my list is… a family sedan. But if you know anything about Mazda, then you know that “Zoom Zoom” is not just the longest running car company slogan (probably ever), it’s Mazda’s way of life. They don’t make the fastest cars in the world, or the most practical, but every Mazda is sleek, stylish, and a boatload of fun to drive. I am in love with my 3, and I love the new 6 for all the same reasons and more. First of all, the interior is comfortable and practical. I got a chance to sit in the front and rear seats, and found ample leg room in both areas (keep in mind that I’m about 5’10”). The front seats provide excellent lateral support for those times when you’re inclined to have a little too much fun on that seldom-travelled suburban road. The dashboard is attractive to look at without being unnecessarily brash, and most importantly, the infotainment system has KNOBS. This may seem like a simple thing to be excited over, but as cars get more and more modern and technology-ridden, manufacturers seem to favor replacing simple and effective knobs and buttons with touch-based apparatuses that generally cause more headaches than they ease. 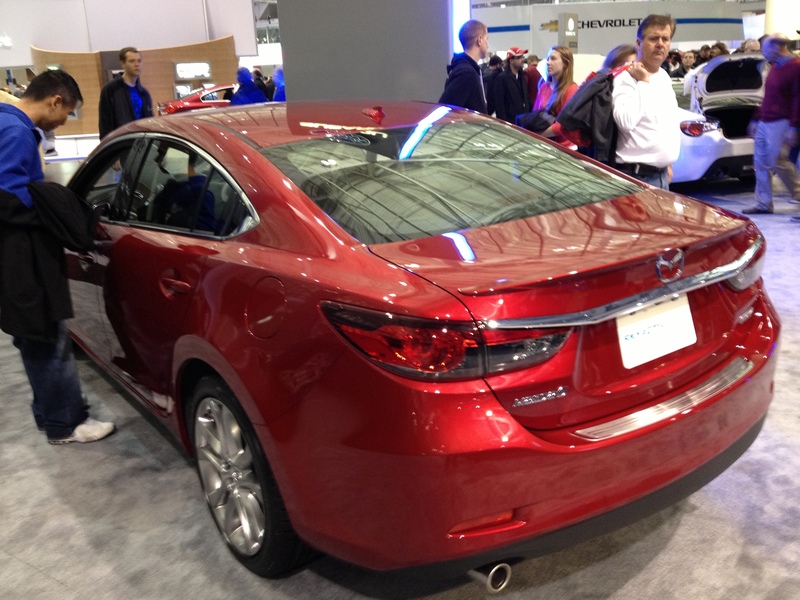 Secondly, the exterior styling is by far the most attractive in the midsize family sedan category. This is a car that actually turns heads, and where Toyota and Honda have taken steps backwards in design with the new Camry and Accord, Mazda has taken a giant leap forward, and this bodes well for them in a super competitive category. The new 6 draws design cues from the Shinari concept, with a strong grille presence and sinister looking headlights. The lines that trace the body create a forward-hunching appearance, giving the car a more athletic appearance that most likely accurately represents how it performs. And with a 2.5 liter 4-cylinder with 184 horses and 185 lb-ft of torque, you can bet it will be quick. Top that off with 38 mpg highway and this family sedan becomes an ever more attractive option over the cookie-cutter soccer practice-mobiles that litter the midsize class. Viva Italia! Fiat has swept American urban environments (and saved ailing Chrysler) with it’s cheap subcompact alternative to a Mini Cooper, the quirky little 500. You’d be hard pressed to find a major street in Boston without a 500 parked or driving somewhere along it. While many dislike the styling, there are just as many who find it endearing, myself included. 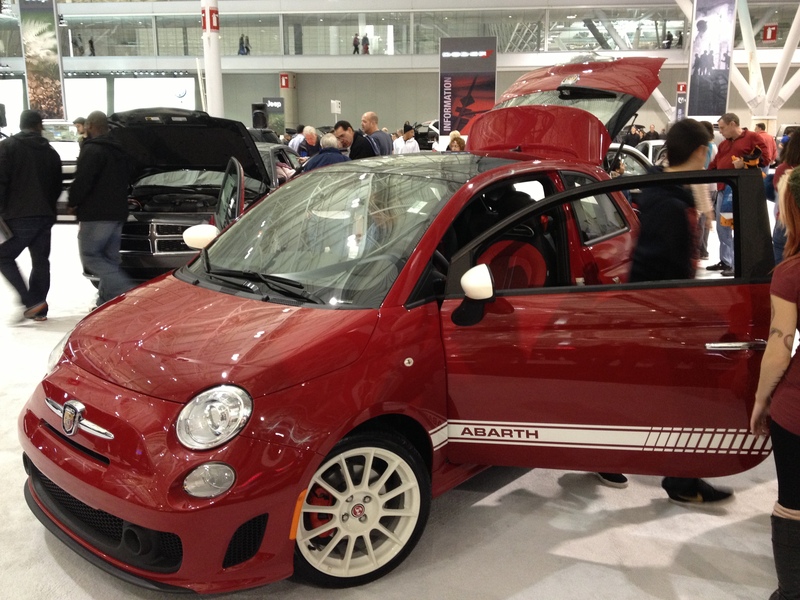 And with the 500 Abarth, Fiat have hit all the right strides. The Abarth that I had the chance to experience was wrapped in the vivid “Rosso” red and adorned with White racing stripes and multi-spoke wheels, giving it a true racing look from the outside. 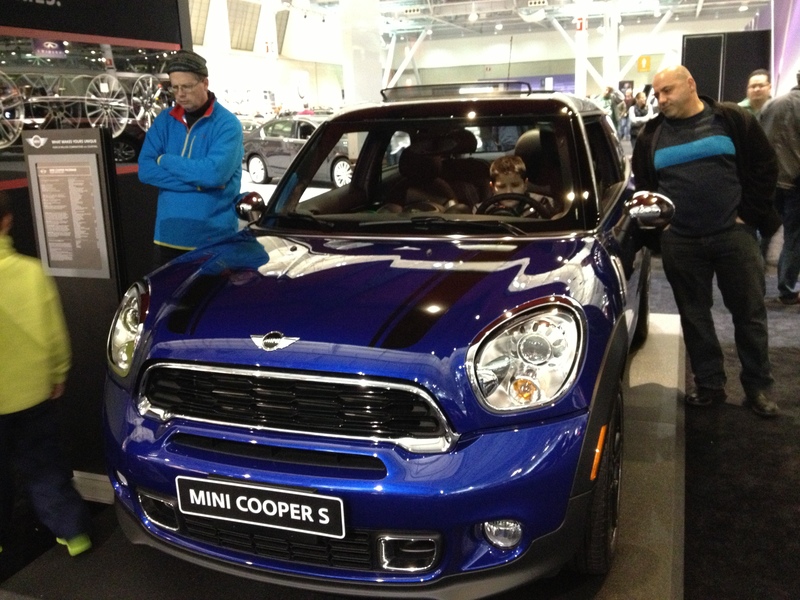 From the cockpit, it is extremely noticeable just how small the car is, smaller than a Mini Cooper, even. But the Rosso red dashboard and the scorpion badge in the steering wheel, there is no mistaking that this car, although small, has big performance ambitions. My one qualm with the interior is that the driving position is a bit strange. The 500 does not offer a telescoping steering wheel, and this is a drawback because without one, it feels like the cockpit was designed for individuals with long arms and short legs, which is, unfortunately or fortunately, not a majority of the population. However, with a 1.4 liter turbocharged 4-cylinder making 160-hp and 170-lb-ft of torque, this little Italian will do 60 mph in 6.8 seconds while still making 28/32 mpg. Granted, this 0-60 time is about half a second slower than a Mini Cooper S, but the Abarth will run the quarter mile in 15.3 seconds at 89.8 mph, which is a full second faster than the Cooper. A 90.6 inch wheelbase and a curb weight of only 2564 lbs can guarantee that this car will be a dream to throw around the corners. And, to top it all off, Fiat has fitted the Abarth with an active locking differential that minimizes torque steer, the kryptonite of all performance front-drives. Bold styling coupled with high output and a low sticker price make this piccolo Italiano the ideal inner-city driver’s car, and considering that I am, in fact, an inner-city driver, that’s hard to argue with. This car makes zero sense. And I love it. Mini has extended it’s line of “niche-splitting” but seemingly pointless creations with the new Paceman, which is essentially a 2-door version of the Countryman with a sloped roof and uglier taillights that somehow work stylistically. This car embodies everything I love about quirky vehicles, and none of the things I can do away with, solely for the fact that it is polarizing, but not off-putting. Everything about the interior styling is classic Mini: the speedometer is mounted around the infotainment system right in the middle of the dash, the row of switches under the climate control toggle driving settings, and everything is circular. Thankfully, though, Mini has finally mounted the window switches on the doors (why it took them so long beats me). This significantly reduces the risk of knocking your Dunkin’ Donuts coffee into your passenger’s lap while trying to open the window, much to their delight. As for the exterior styling, it seems that Mini has made a poor(er) man’s Range Rover Evoque. It retains the same Mini charm we have come to know and love, with the only diversion from the norm being the horizontally-oriented taillights, which marks the first time since Mini’s rebirth that they have gone with this layout. 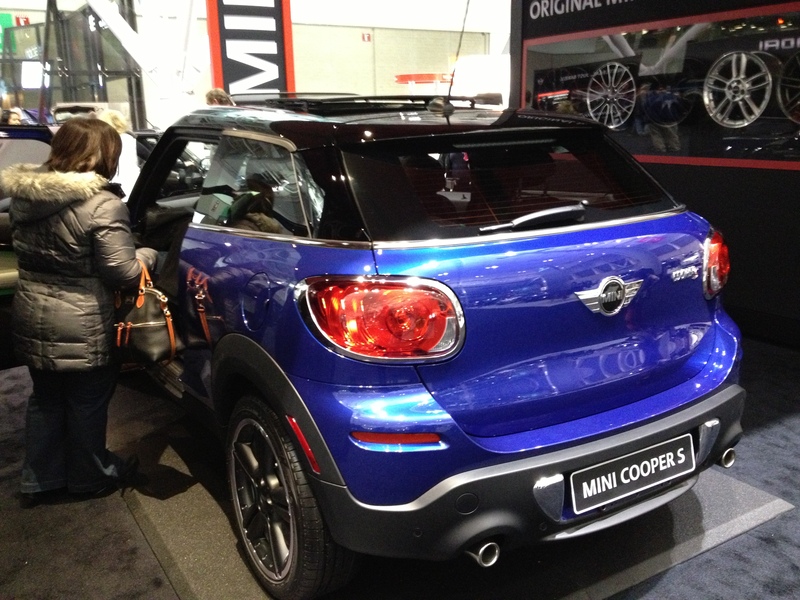 Interestingly, in the style of Porsche and Land Rover, Mini has also fitted the Paceman with a large badge that spans the width of the rear hatch. Naturally, this badge reads “PACEMAN,” instead of something more fitting like “NOT AN EVOQUE WE PROMISE.” Lord knows that if I ever own one, the first thing I’ll do is remove the “E” to make “PAC MAN,” but that’s just me. This joint project between Toyota (Scion) and Subaru has been heavily hyped since it’s conceptualization, and it seems for a very good reason. Many tests by car magazines, blogs, and everyone in between have hailed that this is an exceptional driver’s car, even better than the long-reigning MX-5 Miata, so naturally I had to check it out for myself. 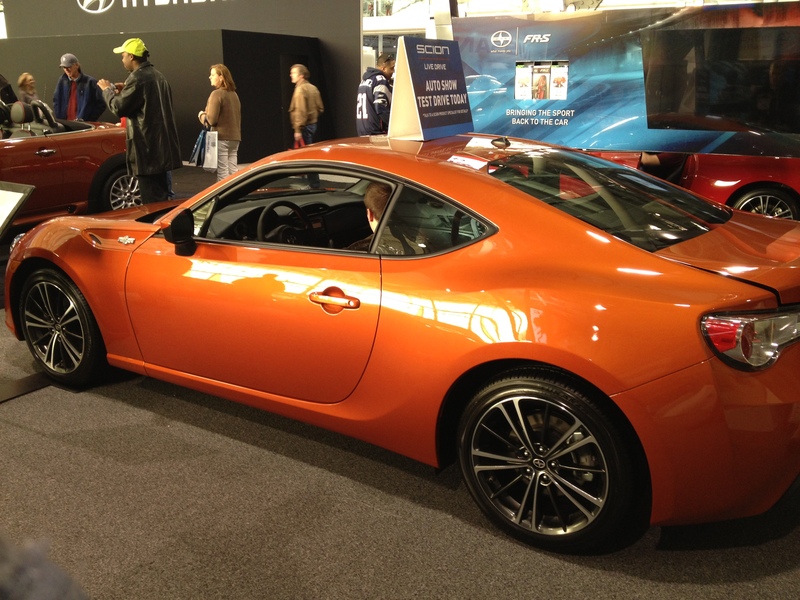 Unfortunately, Scion would not let me test drive one, because of laws or rules or something like that, so I was limited to gathering my opinions at a stand-still. As far as the exterior styling goes, this car is sharp and clean cut, but leaves a little to be desired in the “brash and bold” department. It is, without a doubt, a very handsome ride, but I feel like Toyobaru could have done more to make this exceptional driver really stand out. However, the lines are very clean, the front end is snarling, and I love the hunched front wheel arches, giving it a very agressive and athletic look. The rear end, however, is utterly forgettable. It doesn’t look bad, but the lackluster taillights and tailpipes and weak design lines leave me with a vaguely empty feeling. The interior is quite similar to the exterior, in terms of its minimalistic simplicity. But here, I think Toyobaru hit a high note. There are no frills or extraneous buttons and knobs, and everything is clean and well laid out. I especially liked the small steering wheel, which had an incredible feel to it. The seats provided tremendous lateral support, and the driving position always seemed to be exactly right for throwing this lava-colored hotshot around the corners. Add all of this to a 200-hp 151-lb-ft flat four Boxer engine from Subaru, and, for the first time in their history, a rear wheel drive car, and you’ve got an excellent, affordable ride that’s a dream to drive and won’t break the bank. If I lived somewhere warmer and with better roads, this would be the new car I’d buy in a heartbeat. 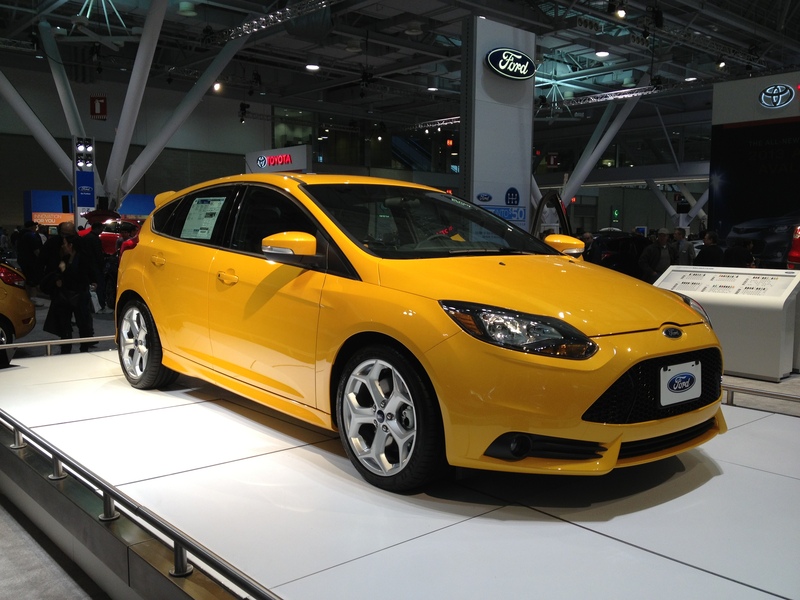 Yes, the number one Common Gearhead ride at the auto show was the outlandish, absurd, Tangerine Scream (yes that’s a real paint color) Focus ST. At first glance, this is a car that does it all. I love the agressive styling, with the “Aston-Martin-on-steroids” front fascia, the large, hexagonal, center-mounted tailpipe, and the 19-inch Y-fork wheels. This car looks straight out of a rally stage, and I’m a big fan of rallying, so I am smitten. Ford hit a high note with the design language of the new Focus, and this ST is a sexier version of what was already great. As for the interior, it’s comfortable, spacious, and loaded with technological goodies. 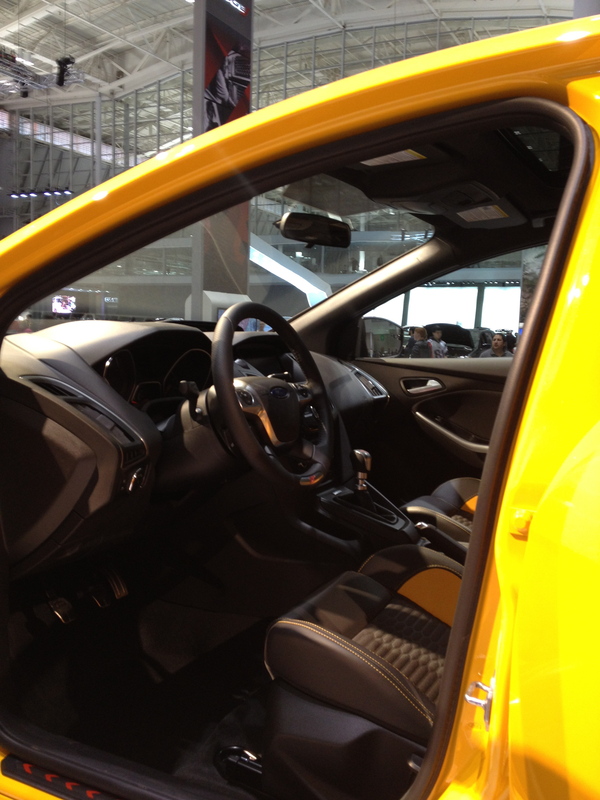 The steering wheel feels excellent in your hands and the Recaro seats are very supportive and comfortable. I am a big fan of the body color inserts throughout the interior, though I think this car would look better in the Performance Blue color that it is also available in. And to top it all off, it’s a hatchback, so you’ll get all of the fun and all of the practicality too. The big kicker for me, however, is the fact that this screamer makes 252 hp and a hopping 270 lb-ft of torque, which gets it to 60 in 5.9 seconds and through the quarter mile in 14.6 seconds at 95.9 mph. Now, those of you who know anything about FWD cars, know that this amount of power will create a ridiculous amount of torque steer upon launch, but Ford has combatted this with an assisted power steering system, and according to many sources (but not me because Ford wouldn’t let me drive one, either) it has worked spectacularly. In a recent comparison between the ST and the aforementioned BRZ, they said that it “may just be the best handling front-wheel-drive car ever,” and that’s saying quite a bit. 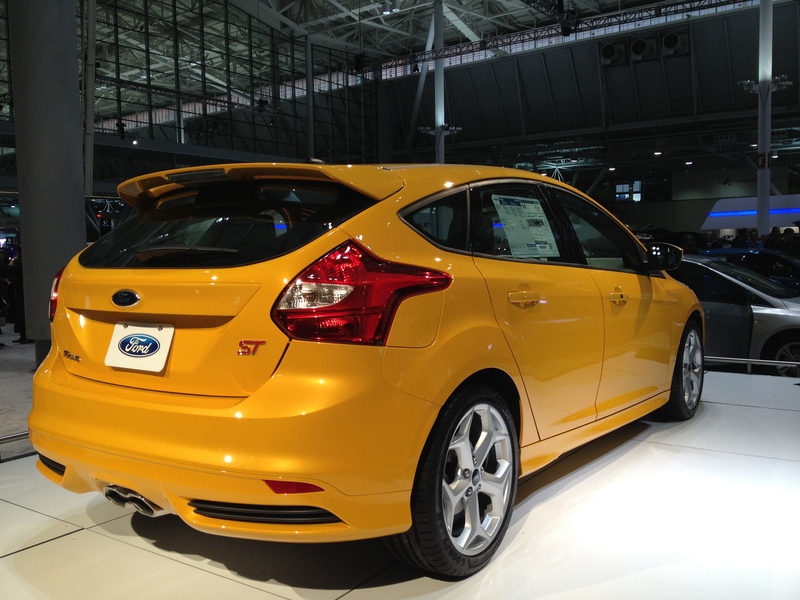 All in all, the combination of practicality, fun, and eccentric and loud good looks make the Focus ST the one to buy. If you’re a more reserved personality, consider a GTI, but if you’re as extroverted as I am, you’d be hard pressed to pass this one up.